People who have celiac disease must avoid foods and beverages that contain gluten. Gluten occurs naturally in barley, wheat, and rye. Beer is usually a beverage that must be avoided by people with celiac disease, as it is almost always made from barley. Wheat beers are made from barley and wheat. However, gluten-free beer can be made relatively easily from sorghum syrup. 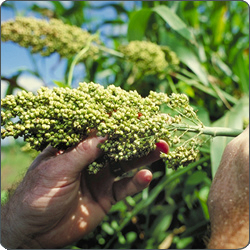 Sorghum is a nutritious millet-like grain that is used in Africa to make traditional fermented beverages. There is even a Nigerian version of Guinness Stout that is made from sorghum. Redbridge sorghum beer, made by Anheuser Busch, is made from sorghum syrup. Brewing methods can be modified depending on the equipment that is available, so sorghum beer can be brewed in a kitchen or outside. At The Vineyard we are using Briess Sorghum Syrup so that we can be sure that your gluten free beer is in fact gluten free. Briess uses unmalted white sorghum grain to ensure no unpleasant aftertaste like red sorghum syrup. It can be used 1:1 malt extract substitute for brewing beer and has sufficient proteins and amino acids for 100% extract brewing. Briess also partners with suppliers to proactively address and prevent cross contamination issues. OK enough with the technical specifications. This month I am going to start you off with a couple of recipes to try and get started from the good folks at Briess. As we develop our Gluten free brewing chops we will expand the recipe list. Click here to go to our Gluten free recipes. If you have a favorite gluten free recipe or you feel your take on the supplied recipes is outstanding then why not sign up for our gluten Free Brewing Challenge. The top three rated beers submitted will win Gift certificates and more importantly bragging rights as Calgarys best Gluten Free brewer.